Whether you’re looking for a last-minute solution to dry your clothes, or need a dryer that can handle large laundry loads, it can be difficult to find an appliance that won’t leave you high and dry. While being one of the most-well known and go-to brands for mobile phones and televisions, Samsung also provides a range of laundry appliances such as front load washing machines and top load washing machines. A variety of home appliances are similarly available. Some of these include vacuum cleaners, cooking appliances and air conditioners. Samsung’s range of clothes dryers mostly includes traditional heat pump dryers with modern features, with a number of machines from the brand’s AddWash series also available. Features such as Quick Dry and the Super Speed Cycle make many of the dryers ideal for people with busy schedules and anyone searching for convenient functionality. Most Samsung dryers can even be managed with the brand’s Smart Control mobile app which lets you start, stop and monitor your load of laundry from your smartphone. The AddWash range also allows you to throw in items or put extra fabric softener after the machine has started. To help you get a fresh start, we’ve created a list with some of the options available and a load of their features. If you’re looking for an energy-efficient and potentially cheaper method to dry your clothes, heat pump dryers might be a suitable option. These dryers are said to use less energy than other types of dryers, including vented dryers and condenser dryers. While heat pump dryers tend to attract a far higher price tag, the seven-star energy-efficient rating on these Samsung appliances could mean lower energy costs in time. Featuring a drying capacity of 8kg, the ‘DV80M5010QW’ model has a seven-star energy rating and is described as a cost-effective and gentle solution to dry clothes. The machine includes the OptimalDry System, which is said to contain a moisture sensor, temperature sensor and heat exchange sensor to prevent items being damaged during the process. Easy Empty Water Tank: displays the level of condensation extracted from your clothes, and contains a Water Tank Indicator to show whether you need to empty the water tank before starting another load. 2-in-1 Filter: removes the need for a Heat Exchanger filter and includes two alarms to remind you when clean the Filter and Heat Exchanger. The Samsung ‘DV90H8000HW’ model is one of the brand’s several heat pump dryers that can fit a load of up to 9kg. The blue transparency crystal glass door on this machine is said to open wider, making this a suitable option for large households as well as anyone who has trouble loading and unpacking laundry. There are also a number of accessories available, including drying racks for shoes and any delicate items. Stacking kits are similarly available if you want to combine your heat pump dryer with a washer. 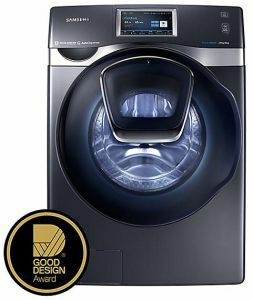 Compared to other dryers like the ‘DV90N8289AW’ model, which also has a drying capacity of 9kg, the ‘DV90H8000HW’ has a slightly lower energy-efficiency rating of six stars. It doesn’t include the Q-rator Laundry Assistant, which suggests drying cycles for each load as can be found with the ‘DV90N8289AW’ 9kg model. But it does offer features like a reversible door and Quick Dry, which are unavailable with a couple of other Samsung dryers. If you live in an apartment and don’t have a clothesline, or constantly forget to put an extra top in the washing machine, Samsung’s AdddWash range provides a number of washer dryers designed to clean and dry clothes in one appliance. Like the brand’s heat pump dryer series, Samsung similarly offers an 11-year parts warranty on the Digital Inverter Motor. The motor is stated to help ensure low vibration and a quiet wash cycle as it does not need brushes to work. If you feel like you’re drowning in problems, the AddWash clothes dryers contain the Smart Check automatic error-monitoring system. This is claimed to recognise and resolve any issues, as well as suggest troubleshooting solutions via the smartphone app. The machine with the largest load capacity is the Samsung ‘WD16J9845KG’ model, which is said to fit up to 16kg in a single load. The brand claims you can fill the washer-dryer combo with liquid detergent and fabric softener once every few weeks because it automatically adds what it considers the right amount based on the laundry weight. The VRT Plus feature is also said to contain digital sensors which help the motor improve the stability of the machine by adjusting the spin speed. 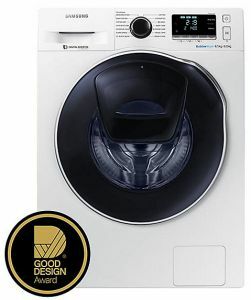 For a quick clean, the Samsung ‘WD85K6410OW’ model features Samsung’s Super Speed Cycle, which is stated to wash a 5kg load of laundry within an hour. There is similarly a 15-minute QuickWash option to cater up to 2kg load of laundry. 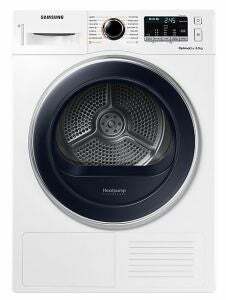 The brand also claims the washer and dryer uses AirWash technology to deodorise your laundry load. This feature is stated to dry clothes with heated air and removes the need to use detergent, water or other chemicals to get rid of any unwanted smells. The auto load sensors are similarly said to give you a ‘full coverage’ and ‘deep rinse’. The gentle touch apparently comes from the ‘soft curl’ design on this model’s Diamond Drum, with small water exit holes also built in to avoid fabric being caught. 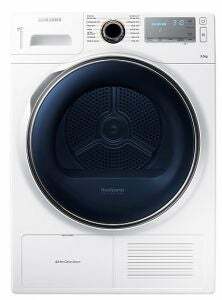 Should I buy a Samsung clothes dryer? When it comes to convenience, the features in Samsung’s dryers are difficult to beat. The brand’s range of AddWash dryers offer a suitable solution for people who live in apartments. The option to wash large loads also makes these machines ideal for wet seasons and rainy days. Samsung’s energy-efficient heat pump dryers could also mean smaller electricity bills, despite the upfront price. Most of these machines have a seven-star energy rating and have a number of features to prevent a load of damage. Don’t let a pile of dirty and damp clothes ruin your day. If you’re in need of a clothes dryer, find out which brands are highest rated by Aussie households via the link below.